The 4STAR instrument is installed through the upper hull of an aircraft for in-flight sun-tracking and sky light-scanning. Congratulations to Drs. Beat Schmid and Connor Flynn at Pacific Northwest National Laboratory for a longtime collaboration with National Aeronautics and Space Administration (NASA) scientists that continues to bear fruit. 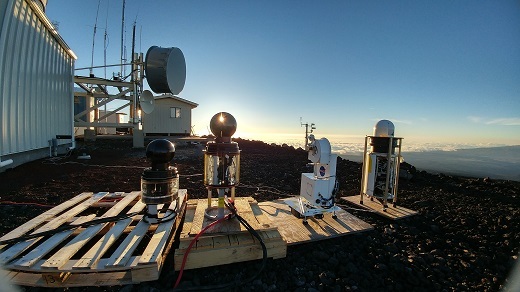 The joint effort to build a unique instrument that collects sun and sky light initially resulted in 4STAR—Spectrometer for Sky-Scanning, Sun-Tracking Atmospheric Research. More than a decade later, the effort has yielded participation in a half-dozen airborne field campaigns and the development of several related instruments, including ground-based 2STAR and 3STAR, and the newest airborne addition, 4STARB. Researchers are using 4STAR and its successors—all part of the nSTAR instrument family—to better understand the interplay of sun energy, tiny atmospheric aerosol particles, clouds, and gases that influence Earth system processes. Light is absorbed or scattered by aerosols, or it reaches the Earth. Measuring the amount of direct light that gets through clouds, aerosols, and gases can help researchers figure out the amount of each atmospheric component. When aerosols scatter light at different angles, scientists can determine particle size, shape, and ability to absorb energy. In August 2017, 4STAR will participate in the ongoing NASA ORACLES (ObseRvations of Aerosols above CLouds and their intEractionS) study, while 4STARB flies its maiden voyage on the NASA C-130 as part of NAAMES (the North Atlantic Aerosols and Marine Ecosystems Study). Drs. Beat Schmid, left, and Connor Flynn, atmospheric scientists at Pacific Northwest National Laboratory, have worked with NASA researchers to develop and refine unique light-collecting instrumentation. 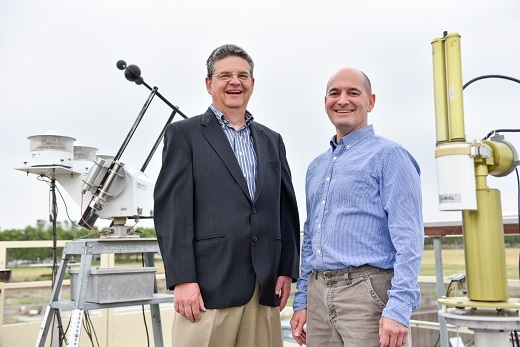 Schmid and Flynn are pictured with several instruments at PNNL’s Atmospheric Measurements Lab “skystand” platform, where routine sunlight and atmospheric measurements have been collected since 2000. "The team's idea was to combine the two things—the direct beam and the scattered light—do it from an aircraft and fully spectral," Schmid said. "That was the dream." Schmid was excited to keep working on the project when he came to PNNL. 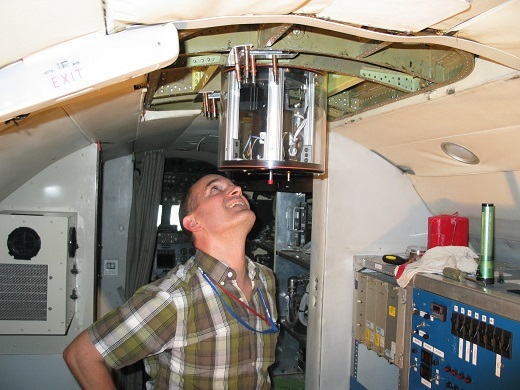 He is the manager of the DOE Atmospheric Radiation Measurement (ARM) Climate Research Facility's Aerial Facility, which is managed by PNNL and provides airborne measurements for researchers around the globe. "Some parts of atmospheric science are more in the realm of discovery, which is still a critical element of science," said Flynn, a PNNL scientist who has been on the 4STAR team for a decade. "In a lot of ways, that's where we are with understanding the interactions between clouds and aerosols, and the effect that has on cloud regimes." Researchers are filling in knowledge gaps with the help of 4STAR and related instruments. 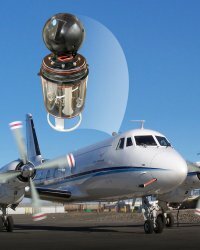 Of ORACLES, which seeks to help improve global models by studying cloud-aerosol-radiation interactions off the southwest African coast, Flynn said: "We're literally flying through those layers, mapping where the aerosols are, where the clouds are, measuring properties, and we are finding out things that nobody knew. Nobody knew how often the aerosol is in contact with the cloud, how often it's above it, and what the properties of the aerosols are." Looking at the top piece of 4STAR, you might mistake it for a bowling ball, but it's actually an optical collector that is installed through the upper hull of an aircraft. During flight, it mines the sun and sky light for information on clouds, aerosols, and various trace gases. The light is sent through a fiber optic cable to temperature- and humidity-controlled light-measuring equipment on the aircraft. Schmid, Flynn, and a group of researchers from NASA Ames are among those who have helped the instrument become what it is. Flynn came onboard in 2007 to help fine-tune 4STAR's sky-scanning capabilities and clean up processing code. "I managed to speed that up enough to make airborne operation feasible, so I was in the 4STAR group at that point," Flynn said. The team constructed a ground prototype (4STARG), got funding to harden it for aircraft use, and put it on test flights on the Gulfstream-1 aircraft operated by the ARM Aerial Facility. In the summer of 2012, 4STAR first saw the light of day for a field campaign—TCAP (the Two-Column Aerosol Project) off Cape Cod, Massachusetts. Dr. Connor Flynn checks out 4STAR after its installation on the Gulfstream-1 aircraft in 2010. The ARM Aerial Facility operates the Gulfstream-1 for the Department of Energy. Since that initial field campaign, Flynn has supported 4STAR operation in TCAP-II 2013, SEAC4RS 2013 (Studies of Emissions and Atmospheric Composition, Clouds, and Climate Coupling by Regional Surveys) mostly over the Southeastern United States and Gulf of Mexico, ARISE 2014 (Arctic Radiation - IceBridge Sea and Ice Experiment) over the Arctic Ocean, KORUS-AQ 2016 (Korea United States Air Quality) over South Korea and the surrounding waters, and ORACLES 2016 off the coast of South Africa. Schmid and Flynn received a NASA Group Achievement Award in 2011 for being part of the 4STAR Development Team. They won the award again in 2015 as part of the SEAC4RS campaign, during which 4STAR flew on NASA's DC-8 in the summer of 2013. "I kept hammering the need for accurate calibration," he said. With 4STARB, the team eliminated a fiber optics rotating coupler that affected the instrument's stability. In its place is a fiber optics clockspring that winds and unwinds, "so it promises the potential of better calibration and repeatability," Flynn said. "We've modified our technology and approaches to fiber optics quite a bit through this process. We learned a lot about transmitting light through fiber optics. Everybody thinks it's easy, but it's not easy to do at the 99 percent calibration level we strive for." Next up for the team is preparation for NAAMES, a five-year study that examines how ocean system processes influence clouds, aerosols, and Earth system processes. "If this continues working," Schmid said, "NASA will use this for a decade or more."